My son has been baking bread using the recipe he gets from KDU. 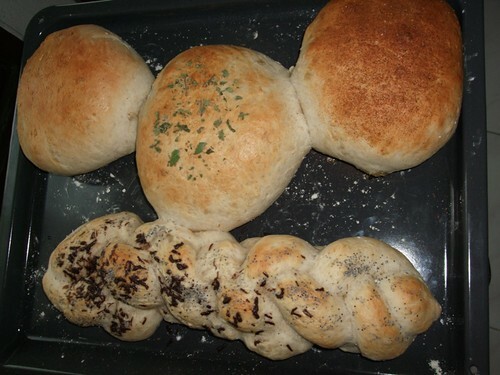 However, today being a lazy weekend, I decided I am going to claim back my kitchen and bake some bread. I have a bread machine but I want to knead bread with my bare hands. 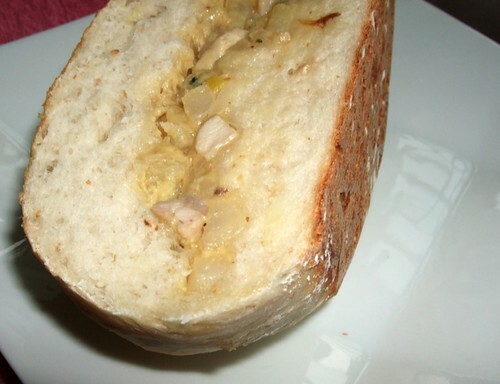 So, I Google for Jamie Oliver bread recipe and stumbled on this simple recipe. Put the flour into a big mixing bowl. Add the dry ingredients and mix well. 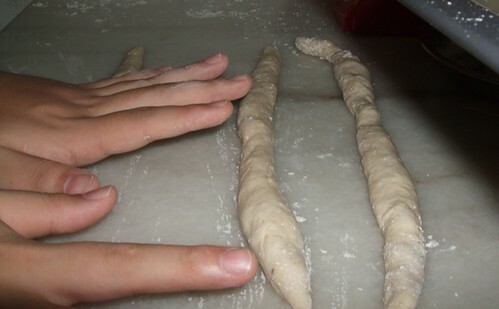 Make the flour into a ‘mountain’ and then, gently make a well. Pour in water, bit by bit and get your hands dirty kneading it. You will get a nice, smooth ball when you have added enough water. Knead them with all your strength. The process will make you sweat and your arms tired. But it is therapeutic, try it. Leave the dough, covered with a moist towel, in a warm place for about 30 minutes. It should increase to twice the original size. When the dough is twice the size, give it a good whack and punch. It will shrink. You can either put the bread into a baking tin or roll them into tiny rolls. 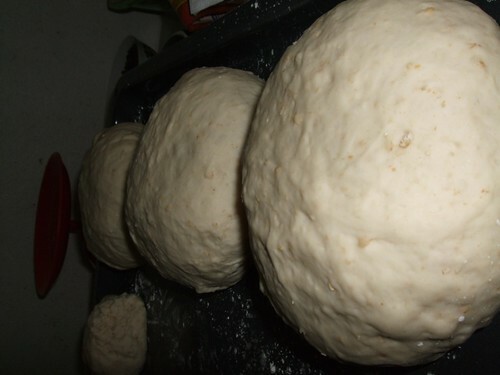 Leave the shaped and formed bread for another 30 minutes so that it increases in size again. Use a temperature of about 175 deg celcius and bake for 30 minutes. You may want to give the bread a quick egg wash for shinier surface. I sprinkle one bun with garam masala, one with oregano and one with blue poppy seeds. My son put some flaked chocolate to his braided bread. Leave enough space in between each bun if you do not want them to ‘hold hands’ like the above buns. 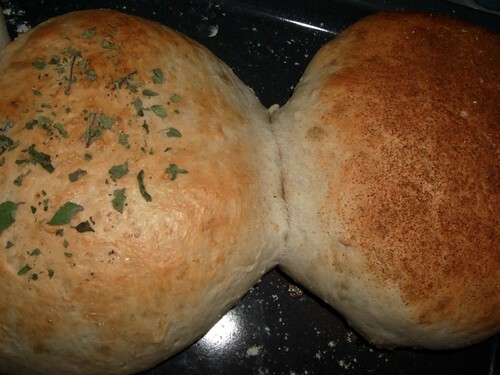 I filled the three large buns with chicken and potatoes with cheese (recipe will be shared in another post). We got some really delicious hot bread. Homemade breads can never be like those store bought ones because we do not use as much chemicals as some bakeries. Normally bakeries use bread softener and other chemicals to get those white fluffy texture. Homemade bread is denser and has more bite. One tip : Remember that you cannot replace dried yeast in a recipe with fresh yeast. The weight of dried yeast versus fresh yeast (found in blocks in frozen food section in supermarket) yields different result. How to know if the yeast is fresh? Test it. Jamie Oliver, one of my favorite chef. But I hate it when he used his hand all the time. I seldom see him use the equipment to cook and decorate the food. Wow….these look delicious. I could almost taste them thru the computer screen. Thanks for sharing…I will have to give a few of them a try. I actually have a kg of bread flour sitting at home. Time to make use of it! Thanks for this recipe – will try it one of these days, before the flour goes bad, hehe!